The Exclusive Editions of the Honda Amaze, WR-V and Jazz get minor cosmetic updates, and are based on the top-spec VX variant. 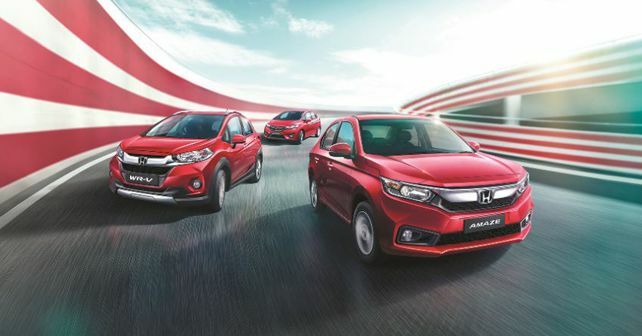 In order to push sales of the Amaze, Jazz and WR-V, Honda has launched special Exclusive Editions of these cars in the market. As the name suggests, these three models come with some cosmetic updates over their regular counterparts. All the Exclusive Edition variants are based on the top-end VX variant of their respective make, and cost only a slight premium over their standard offerings. The Exclusive Edition of the best-selling car of the trio, the Amaze, is available on the VX variant of both diesel and petrol versions. Highlights include new alloy wheels with dual tone black stickers, premium black seat covers, sliding armrest, Exclusive emblem and illuminated side sills. The petrol version of the Exclusive Edition of Amaze is priced at Rs 7.86 lakh, whereas the diesel is Rs 8.96 lakh. This is only Rs 13,000 more than the VX grade variants. The WR-V Exclusive Edition is also offered in both petrol and diesel options. The highlights are more or less the same as the Amaze, but you don’t get dual-tone alloy wheels here. Instead, there’s a black tailgate spoiler with a LED strip. The petrol variant is priced at Rs. 9.35 lakh, and the diesel is Rs 10.48 lakh – which means it’s around Rs 18,000 more than the regular VX variants of the WR-V. The Honda Jazz Exclusive Edition is only available with the top-end VX CVT petrol variant. Like the other two, this also gets similar visual updates. But, unlike the WR-V, this one gets black alloy wheels. It commands a premium of Rs 19,000 over the regular model as it’s priced at Rs 9.22 lakh. Mechanically all the cars are unchanged. All prices are ex-showroom, Delhi.